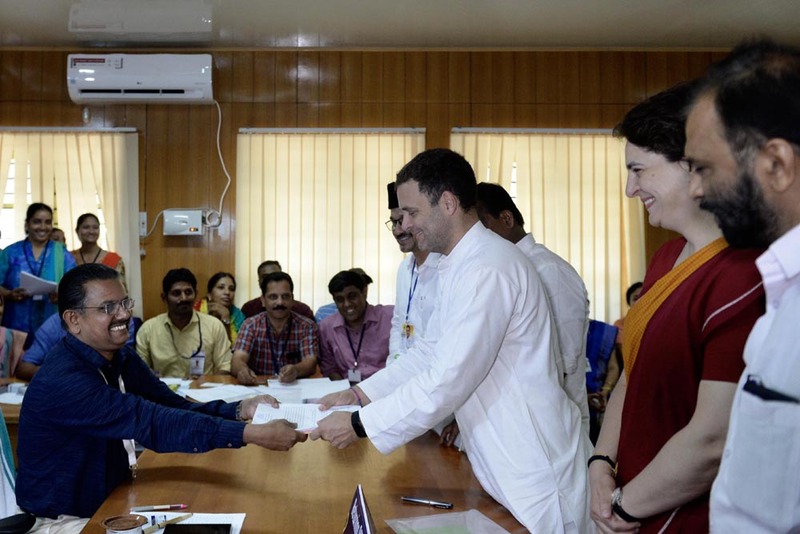 Congress president Rahul Gandhi done a roadshow on Thursday after filing his papers to contest the Wayanad lok sabha seat evoked a massive response, literally rocking the mountain town Kalpetta. Braving the scorching heat, Mr. Rahul Gandhi and Congress general secretary Priyanka Gandhi Vadra and senior Congress leaders, rode in an open vehicle. The police and security agencies had a tough time controlling the crowd. An estimated one lakh people, including men, women, and children, assembled in the town, some clicking pictures on their mobile phones. Workers of the Congress and the Indian Union Muslim League gathered in large numbers waving party flags. The SPG had to change plans of the one-hour roadshow after the crowd swelled on the streets from 9 a.m. Many occupied spaces atop buildings. Consequently, a 15-minute ‘roadshow’ was taken out from 11 a.m. after he flew down in a helicopter along with his sister to the SKMJ Higher Secondary School ground. He went to the Collectorate to file his nomination, a distance of 400 m. Amid tight security, Mr. Gandhi, shook hands with many en route. The original plan was to carry out a 2-km roadshow after submitting his nominations from the collectorate to the old bus station. But the route was changed via the Kalpetta bypass, another 5 km, following the massive crowd in the town. Hundreds of supporters were seen joining the motorcade.